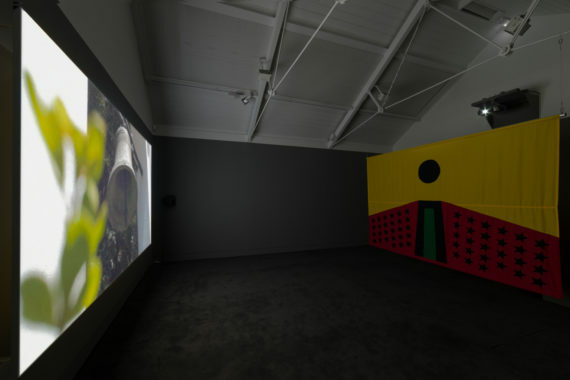 For his writing task following the workshop at Jerwood Space, London, Bath-based Trevor H Smith chose to write an 800-word profile of the 3-Phase artist Larry Achiampong. 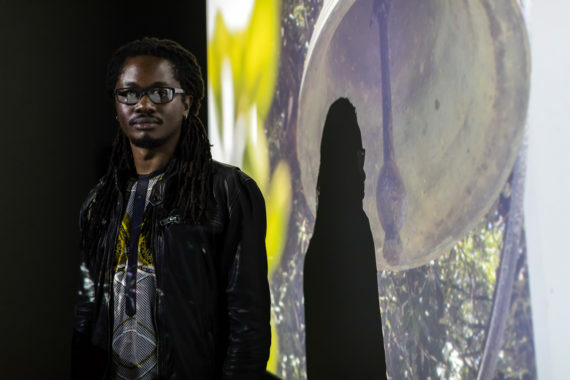 And what rich subject matter Achiampong lays before us, from the music his mother gave him, through photographic montage, to hacked digital landscapes, this 34-year-old British-Ghanaian artist has, since his days as a postgraduate student at Slade School of Fine Art, revealed himself through his work. 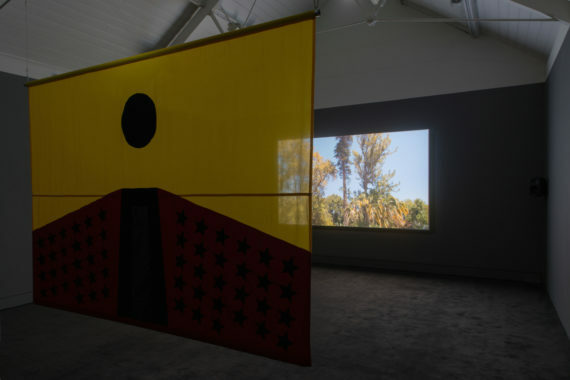 Alongside work by Mark Essen and Nicola Singh, a second Pan African Flag For The Relic Travellers’ Alliance is installed at the Jerwood Space as part of 3-Phase, a development initiative run by the Jerwood Charitable Foundation. Together with Achiampong’s film, Relic 0, this new work combines themes of identity politics, racial stereotyping, post-colonialism, and the acceptance of digital spaces as real locations that people negotiate daily. 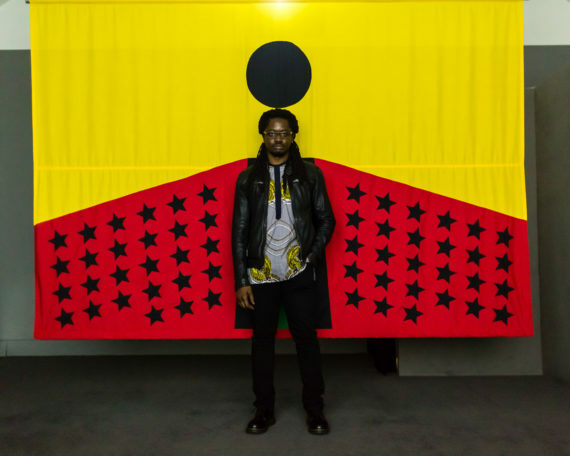 The flag, which is hung in opposition to the projected film, combines multiple symbols of the pan-African experience; a black star for each of the 54 African nations, a field of red representing centuries of bloodshed, and a golden sky signifying a prosperous new dawn. A single black figure in the centre of the flag represents the movement of people, through displacement and mass immigration, that has characterised the continent since the dawn of humanity. This experience directly influenced Lemme Skool U (2007), a photographic montage featuring a young Achiampong from his school years up to his graduation picture. In each photograph, his face has been replaced by a black circle whose only feature is an illustrated pair of exaggerated, cartoon-like bright red lips. The image is as reductive a representation of black identity as one can imagine. Simpler than an emoji, it reflects a colonial-era stereotype that, although no longer openly portrayed in polite society, has drifted back to the surface as part of the post 9/11 swing to the right in Western politics. Achiampong wants us to know that not much has changed. “A lot of this derogatory stuff is still in the air,” he says. “It’s there in the art world, too.” Which might explain why he performed a physical version of this piece in Tate Modern in 2013. Achiampong’s selection for 3-Phase follows several collaborative projects with well-established artist David Blandy – a union born out of a mutual love of “video games, comics, and hip-hop” as Achiampong said in discussion with Blandy and curator Ben Borthwick at the opening of their film Finding Fanon, at Plymouth Arts Centre earlier this year. That the Plymouth exhibition followed Achiampong’s selection as one of Britain’s representatives at the inaugural Diaspora Pavilion at the 2017 Venice Biennale is demonstrative of the increasingly high regard in which he is held by his peers. As much as Achiampong wants to talk about identity politics and everything that goes with it, he also wants to discuss the human experience. In mining his personal archive for material, he has unearthed a multitude of cross-cultural reference points to which anyone from his and subsequent generations can relate. 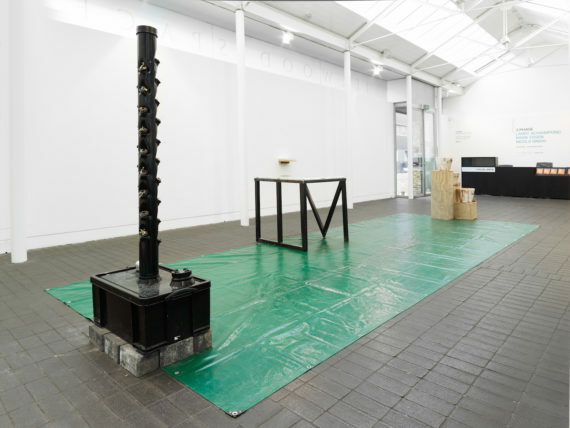 His ongoing collaboration with Blandy may at first seem an unlikely fit, but despite the differences in their upbringings – Achiampong is black and working class, Blandy is white, middle-class, and privately educated, to boot – their backgrounds include many shared experiences. Their childhood and early adult years straddle the periods pre- and post-internet; Achiampong talks about “growing up an age in which digital and technological frameworks were becoming more central to the way we live our lives”. Together, they have created works based on the vast digital landscapes found in video games. By hacking into the framework of games such as Grand Theft Auto 5 they can take a character on a journey away from the narrative of gameplay and into its surrounding landscape, as they did for FF Gaiden (2016), to which they also added an original score and audio recorded from volunteers discussing contemporary identity and selfhood in the digital age. 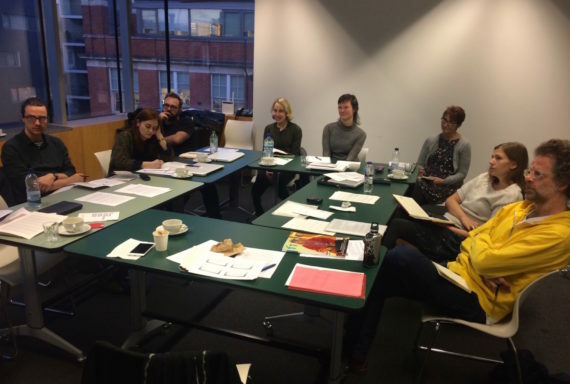 Having visited the 3-Phase exhibition at Jerwood Space, London during the second a-n Writer Development Programme workshop, Eastbourne-based writer Judith Alder chose to write her 800-1000 word profile piece on the artist Mark Essen. On a visit to Mark Essen’s Birmingham ceramics studio you might come across an artist in residence exploring “unconventional means of making humans”, or find the winner of The Woman’s Hour Craft Prize running a clay workshop for beginners. Another day there might be a hen party in full swing, or a workshop run by the homeless charity Crisis. This unique studio, used not only by artists but by all sections of the community, epitomises Essen’s ethos of combining traditional craft materials with fine art practice, tackling big conceptual issues while engaging with ordinary people, and promoting health and well-being through art. You can’t rush the making process, believes Essen, and there is time here to take control and enjoy making, with no expectation of the end product: “There is no such thing as a bad ceramic,” he says. In an interview with curator Linsey Young in 2016, Essen explained how he discovered clay during a residency at Wysing Arts in 2011. It was the year The Grantchester Pottery was formed and visiting artists were working with clay. The residency offered Essen six weeks of time and space and marked a changing point in his career, as he turned away from purely conceptual work and developed a more hands-on practice. A 2015 article in the contemporary ceramics magazine C-forum mentions Essen as one of a number of artists using clay as “an affordable and easy way to make sculpture, to blast through ideas in the studio quickly… a kind of 3D sketch that is easily rubbed out or made permanent depending on how successful it is deemed.” This certainly applies to Essen, who does not draw in a conventional two dimensional way. Born in 1984 in Reigate, Essen moved to Birmingham to go to art college. He graduated in 2007 with a Fine Art BA, achieving an MA in Sculpture from the RCA in 2014. Experiences such as the Wysing residency and others at Edinburgh Sculpture Workshop and South London Infinity Projects have provided the opportunity to develop his practice alongside other artists and curators. Selection for exhibitions such as Bloomberg New Contemporaries, Rough Music at Cass Sculpture Foundation and ‘That continuous thing’ at Tate St Ives have kept him in the spotlight. Essen speaks animatedly about the people and ideas that are important to him. He mentions philosophers and social thinkers, quotes Heidegger – “technology moves faster than culture” – and refers to an article on “metabolic rift”, Marx’s theory of ecological crisis caused by capitalist production. He is also a fan of Newcastle University’s Professor Richard Clay, who recently presented a series for BBC4, Utopia: In Search of a Dream. Essen’s principles are grounded in his knowledge of political and social movements, his interest in the impact of the Industrial Revolution, and characters such as John Ruskin, the Arts and Crafts movement, and Matthew Boulton, the 18th century manufacturer who enabled mass production of coinage. The artist’s concern with currencies began at university and developed in response to his exploration of the disappearance of money as a physical object. He almost bought a bitcoin when he was at the RCA but couldn’t afford to waste money on it, he says – a possible cause for regret now that the virtual currency’s value currently outweighs that of gold. A commemorative Bitcoin now features in Essen’s new installation at Jerwood Space, London. The installation is part of the first of three exhibitions for 3-Phase, an artist development initiative aimed at supporting artists with less than 10 years practice. Essen’s installation, ‘Tis ‘Ard to be a God, is comprised of three new works and is contextualised in a thoughtful essay, Ideological Warfare in the “Age of Clay”, by Angels Miralda. In it she reflects upon clay as a “staple product found ubiquitously in advanced cultures…”, “a fundamental tool to the three ideological pillars of the 20th century… communism, capitalism and facism.” It is these three words which are presented on three clay buckets in Essen’s reworking of a Greek water clock, Believe Your Beliefs and Doubt Your Doubts. A second work in the installation, A Possibility This Will Never End, features a display of defaced and alternative currencies, including the Bitcoin, hinting at the possibility of alternative economic systems. The third work sees him literally nurturing the seeds of ideas in his hydroponics tower, The Illusion of Growth. Through this hydroponics system, he points to the notion of a more sustainable future, with a nod to Degrowth, a movement advocating the downsizing of consumerism, and an emphasis on well-being, culture, nature and community. Essen’s previous work seems hard to pin down. Earlier subject matter and means of making are varied with works such as Mobile Mixtape, a music mix inspired by ‘90s rave culture, and Chisel Break, a film of found footage, exploring paranoia, power and popular culture. His work for 2013’s New Contemporaries, Everything will come to an end but your testament will still exist, consisted of an enigmatic assemblage of oil drums, ceramics, a mirror, a plant, and a chess table. 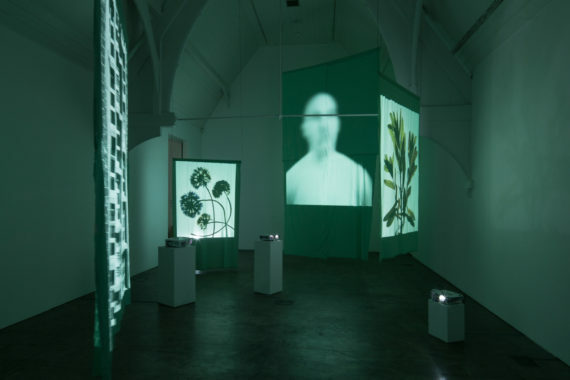 Sarah Williams, Jerwood Visual Arts’ head of programme and one of the 3-Phase selectors, suggests that Essen’s current work demonstrates more clarity of intention. She says he stood out among the 719 applicants for 3-Phase because he showed the potential to push forward with ideas around social change; ideas which had been in his mind for a long time, but which had not yet visibly surfaced in his work. 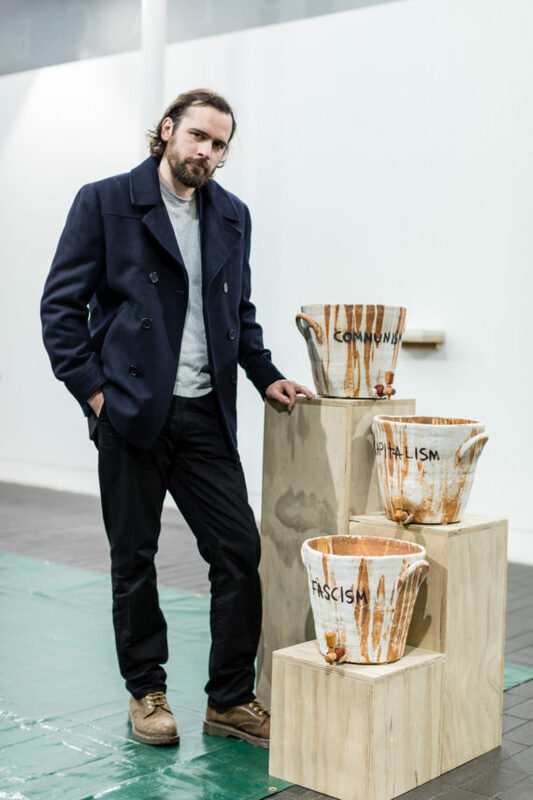 Linsey Young describes him as “very left wing and very politically outspoken”, but like Williams, she notes the absence of visible representation of political ideologies in his work, though she acknowledges that his decision to set up his studio in Birmingham is “a hugely political act”. Essen cites contemporary artist and social activist Theaster Gates as an influence. Gates uses funds raised from sales of his artwork through the art market to finance projects which bring about social change. This, says Essen, is what he wants to do. Like Gates, he presents an optimistic alternative to pessimistic visions of a dystopian future. Perhaps it is this optimism and Essen’s attempts to posit alternatives which make him stand out. In the words of another of Essen’s heroes, John Ruskin: “What we think, or what we know, or what we believe is, in the end, of little consequence. The only consequence is what we do.” And there is no doubt that Essen’s actions speak louder than words.